We spent a couple of days at Camping L’Aube in Ruimar on the Ebro delta, it cost 17 euro a night for the two of us plus electricity. Some interesting countryside en route – the Ebro delta is a major rice-growing area, criss-crossed with irrigation canals, and there was a lot of harvesting going on – huge combines with tracked drive on the front because they are arse-deep in water (bottom picture). And more Grey Herons and Little Egrets than you could shake a stick at in the harvested fields waiting to catch the frogs in the water. This is another biggish site but mainly chalets and fixed caravans with those huge awnings we saw in Portugal last year, and clearly geared to the local market. Fairly busy when we arrived but mainly weekenders who left soon after and it is just us, the Germans next door and (just arrived) a British couple we met earlier at a bird hide. There are lots of blue gums here and the tree over our plot is the roosting spot for hundreds of sparrows; fortunately they go to bed at about seven and don’t get up again until seven thirty so they do not disturb us. Rather a long-winded check-in because the lady didn’t speak a word of English, required a vast amount of information (Father’s name was one we skipped) and didn’t understand the computer system. Facilities OK: electricity needs two-pin connector and the lady has to unlock the box to connect, plenty of hot water in the showers, toilet seats, paper in each toilet, a chemical toilet emptying place (but nowhere to empty grey water). A nice touch is that there is a washing-up place shared between two plots which has water and – amazingly – a plug. Unfortunately the campsite, indeed the whole of the delta, is thick with mosquitoes. As usual, they concentrate on Sheila but they must be desperate because they even had a go at Gilroy. On our first day we went out with the scope and saw cormorants, grey heron, marsh harrier (more here than we have ever seen anywhere), stonechat, coots, reed warbler, little egret, aquatic warbler, kingfisher, sooty tern, swamp hen and redstart.Our campsite was very convenient for some bird hides which we could cycle to. On our second day we decided to go further afield towards Poble Nou. We left a lot of gear in the tent at the site and took the van and had an excellent day: all the birds of yesterday plus a squacco heron (top picture) , great crested grebe, wren, pied flycatcher, little grebe, red-crested pochard, bluethroat, whimbrel, great egret, avocet, ringed and little plovers, cattle egret, mallard and common tern. Poble Nou was a pretty little town which, by the size of the carparks, hotel and restaurants, gets pretty busy in the season. We later went down to the beach at Eucaliptos where there is a vast beach and a sand road. There are salt pans along the spit here and what was surprising was the big commercial vehicles having to use the sand road to get to the salt workings. While we were there, a big lorry stopped at the end of the tarmac and you could see from the body language of the vehicle that the driver could not believe that he had to drive along the beach but eventually he did (picture above). Rice harvesting in the Ebro delta. 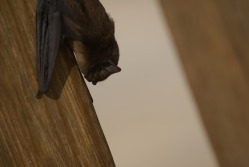 At one of the observation decks we came across this little bat, at the time of our visit all the bats should have left for warmer parts - this little chap seemed to have been left behind.